Steven (Chicagoland, United States) on 29 November 2012 in Architecture and Portfolio. A view looking down the dining table toward the fireplace, where I wanted to highlight the banners and the intricate wood-carved panels in the ceiling, which were imported from Italy. The panels came from a 14th century church wall, which is why their heads are all leaning to the right. 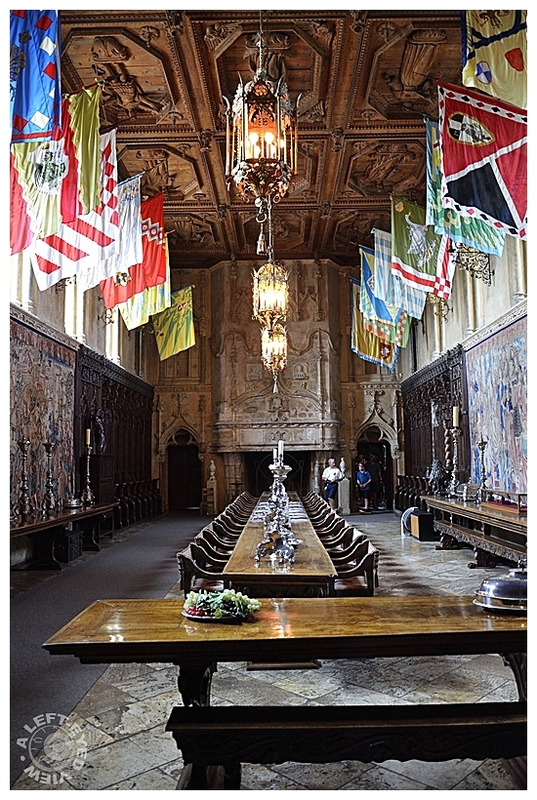 Hearst Castle's dining room is where all meals were eaten. Hearst and architect Julia Morgan called this grand room the "Refectory," the term for a monastery dining hall. Its high windows, bright silk banners, and gleaming silver candlesticks convey the atmosphere of a church from the middle ages. Oddly enough, the table was set "picnic style" with paper napkins and bottles of French's mustard and Del Monte tomato ketchup. Meals would include beef from the Hearst property's working cattle ranch. Hearst's guests were like a who's who of the rich and famous, with stars like Gary Cooper, Clark Gable and Joan Crawford; political leaders like Winston Churchill and Calvin Coolidge; and notables like Will Rogers and the American astronomer Edwin Hubble. Bob Hope and his wife, Delores, also spent their honeymoon here. Superb image! What a place. Such an enormous amount of detail and colour ion this shot, great work! Perfect perspective and a vivid scene rich in history! Excellent shot of this over the top beauty. I'd be dropping food all over myself, gawking up at those incredible panels. @Rick: You bring to mind an incident I had in Hearst Castle........I was looking up at a tapestry and stepped on an area rug that set off an alarm. AACCKK!! Great perspective of this impressive place! Wonderful perspective of this spectacular room. It is really eye-catching! The colors and the detail are beautiful. Fabulous framing and POV. A beautiful image. Amazing detailed and embellished decor; fantastic light and capture! A superb shot, and you have certainly captured the feeling of being there. This is fantastic. A wonderful angle. This room is absolutely beautiful! A very bright & cheery room.... and very colorful with all the banners. The ceiling is just amazing! It seems to be jam-packed with things to see. A super capture Steven... I enjoyed the informative write-up also! I can only imagine what it would have been like to dine in there with the rich and famous.